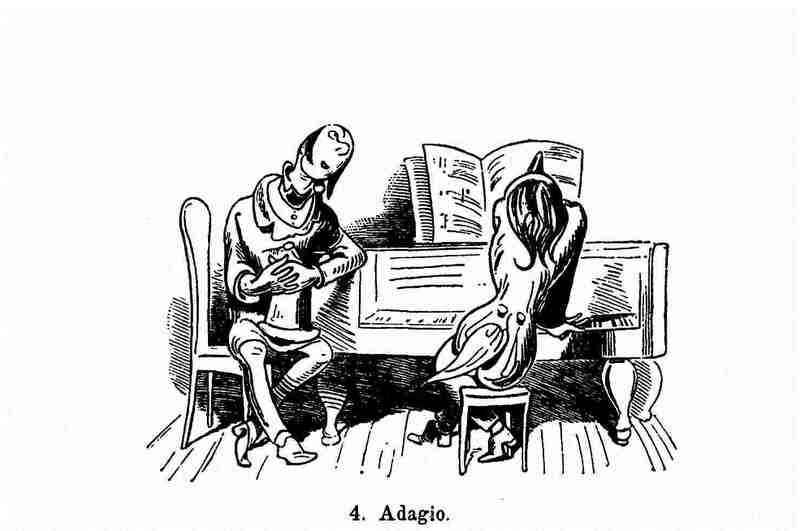 For today, an altogether practical subject for those of us who play piano and are pianists: Perhaps it has still not gotten about every­where that piano playing appeals to the eye more than to the ear! Pianists have then a fair chance of winning competitions only if they re­in­force their playing with expressive body movements and facial expressions. A current, reportedly serious study proves it: That is to say, upon merely watching soundless (!) com­pe­tition shots, lay people as well as pro­fes­sio­nals chose the same (!) winners as the expert panel of judges at the same competition. In other words: the eye, not the ear pre­de­ter­mines solid piano playing. Or put another way: The jury, wearing earplugs, would also have nominated the same winner. Now that’s something to really make you think…. Personally, I’m surprised at the results of the study because such “antics” rather distract from what is essential. On the other hand, I am also reminded of a comment by Alfred Brendel as to the enormously suggestive effect body-language signs can have on the listener. I’ll be looking briefly into both aspects in the following. What might Beethoven have meant with this strange crescendo directive and how on the piano do I make the sound swell from p to the sf that the next measure asks for? I do not know of any such “unplayable” directive for dynamics in piano music “before” Beethoven. But it does occasionally occur with Beethoven (I have also found such passages in Schu­bert, Schumann, Liszt, Rachmaninoff). Beethoven seems to be the first of all who pushed the sonorous limits of the keyboard instrument in this manner. Beethoven’s autograph of the Piano Sonata op. 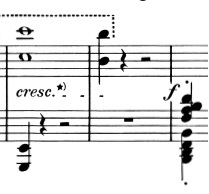 7 is lost, but this unrealisable p with following crescendo is ac­tu­al­ly in the first edition. 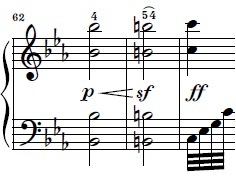 Within the passage’s context it nevertheless seems clear what Beet­hoven meant (heard/intended), but notated strangely: that is, a “big” crescendo over four measures to the C-minor fortissimo (m. 64). Here, we must know that the cresc.— shows up only in Beethoven’s autograph of the Les-Adieux-Sonata op. 81a, but not in the first edition that he corrected. Alfredo Casella, in the commentary to his Ricordi edition (1919/20), would advise simply ignoring this cresc. and playing the subsequent octave b♭ pianissimo – because the crescendo cannot be executed. “The sound of longer notes on the piano can be modified (1) by means of the accompanying parts where such are present, (2) by means of syncopated pedals and (3) by means of a process of movement displaying the pianist’s cantabile conception. These movements have an impact essentially on the touch of the note itself, but also on its preparation and continuation. Many crescendi on a single note can be conveyed in the concert hall only by suggestion.” (Alfred Brendel, Nachdenken über Musik, Munich, 1982, p. 35). According to this, body language is very important not only for winning potential com­pe­titions, but no, also for realising the music text. 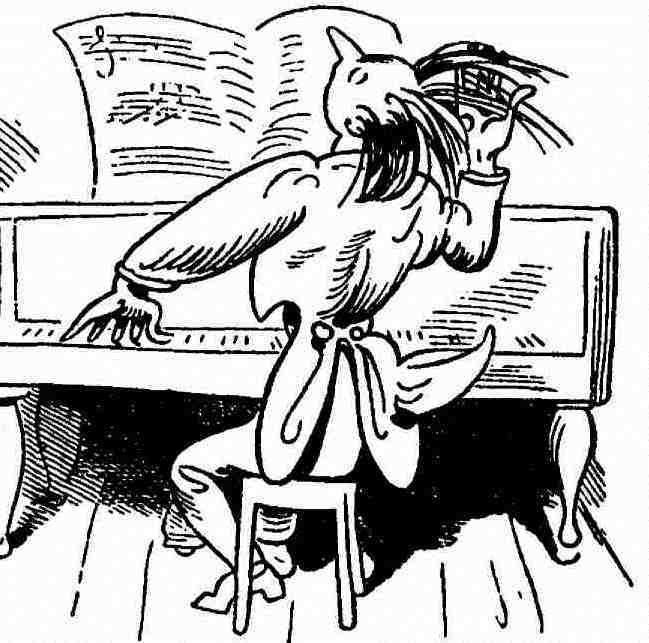 Apparently, only the piano player who can be moved by the composer’s intention of the really inaudible – emotional, who can also be correspondingly – bodily – moved, and only whoever is moved in such a way can also move the others, the listeners who above all are also spectators. These actually think then of experiencing a sustained surging and receding piano sound, even though in reality it is not to be heard. Why not give it a try sometime. This entry was posted in Alfred Brendel, Beethoven, Ludwig van, Hungarian Rhapsody (Liszt), Lang Lang, Liszt, Franz, Marc-André Hamelin, Monday Postings, piano solo, Piano Sonata op. 31 nr. 3 (Beethoven), Piano Sonata op. 7 (Beethoven), Piano Sonata op. 81a Les Adieux (Beethoven), Victor Borge and tagged Beethoven, body language, Hungarian Rhapsody, interpretation, Liszt, piano, piano player, piano sonata. Bookmark the permalink.